Seniors from all four Sanpete high schools—Gunnison Valley High, North Sanpete High, Manti High and Wasatch Academy—participated in activities for Utah College Application Week (UCAW) during November. UCAW is sponsored by the Utah System of Higher Education’s (USHE) StepUp to Higher Education campaign, and is part of the American College Application Campaign, a national initiative to reduce the barriers for first-generation and low-income students. Students from GVHS kicked off the week on Monday, Nov. 14 with an assembly featuring Clint Pulver, former member of the world renowned Blue Man Group and youth motivational speaker. He shared stories highlighting the impact each of us has on others. 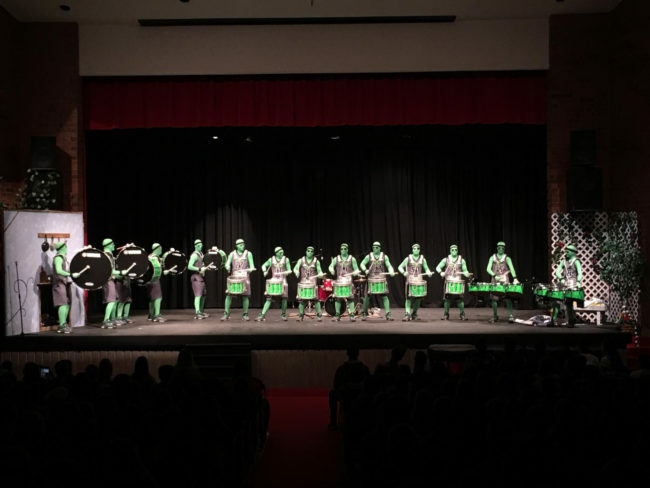 The Green Man group, a drumline from Utah Valley University, provided students with entertainment during the assembly also brought a message about finding your purpose. The Green Man Group also performed at a UCAW kick-off assembly at MHS. After the assembly, students navigated to various classrooms to participate in workshops and question-and-answer sessions with a panel of Snow College students. While living with people you don’t know can be tough, panel members said they have built some of their best relationships with their roommates. Another high school senior asked how the college students how they pay for “life” while in college. The response from each panel member was simple: Work. One college student said he had to hold two jobs and go to school full-time. “You have to have the best time management in order to be successful,” he said. Students from NSHS also had an assembly with Snow students to kickoff their week. At all high schools, students were presented with speakers, materials and tools to help them find the funding they need for college, a process many colleges have streamlined. From Wednesday, Nov. 16 to Friday Nov. 18 students from GVHS, MHS and NHSH met with counselors to decide which schools they wanted to apply to, and with the help of a counselor, each of filled out the Free Application for Federal Student Aid (FAFSA) and also applied for scholarships.